The friendship life cycle - circle of 5! Recently, a friend of mine was discussing with me that as a single woman, she often relies heavily on social interactions to meet her emotional needs, but that as most of her friends are coupled, these friendships often seem one sided, and at times exhausting to maintain. My friend seemed to feel that she had to really put in the effort for these friends, and conduct the friendships on their terms. She felt she didn’t have many friends whom she felt gave as much to the friendships as she does. She says she understands their family lives and that they have less time for her, and sometimes she has to be flexible to fit in around their work, children and partners, however, that always being the one to make all the effort is tiresome. The conversation rolled around to my personal “Rule of 5.” To recap this for you, I find I am at my social peak when I maintain 5 close core friendships. Any less and I start to feel lonely, and anymore and I start to feel drained and overwhelmed. I give a lot of myself in my friendships, so that may be why my number can be counted on the fingers of one hand! These are the main 5 people I will make effort to maintain strong friendships with and not usually feel "tired" in doing so, because the reward is worth the effort, and the relationships are reciprocal enough that I am not score keeping on who made more effort. Each person’s number will be unique to them, depending on their friendship style and how much time effort and energy they place into friendships to begin with. There is no right or wrong number, although I think 5 is ideal, 1 is too few, and 10 is probably too many. But hey, each to their own! I was pretty pleased with myself as I encouraged my friend to consider her close friends and put a number on it. My friend had printed pictures of her fur babies for the picture on the front of her personalized Christmas cards this year, and disclosed that she had printed only 10, so that must be her number. She was pretty pleased to state that I myself had made it into her top 10 close friends! I am going to be honest with you. If I did make it into her top 10, my best guess would be 10th place! Not that I need her to rank us, but although we do at times border on a close friendship, and it may in time grow into a closer one, for now, I’d categorize us into the casual, recreational type of friends. Not that it matters. I have long ago accepted I am an outer circle friend of hers, and likely to stay there. 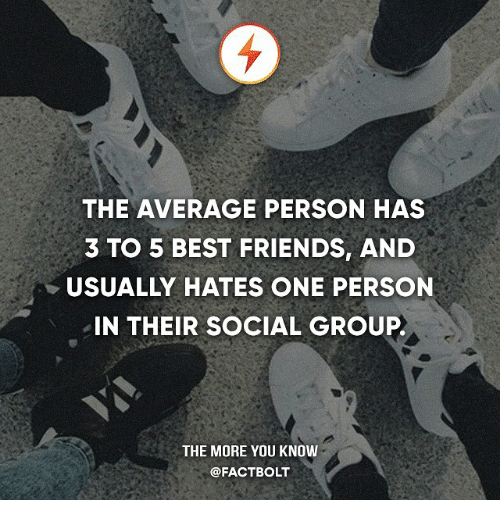 Just as I have my own outer circle friends. What I was asking my friend, was to identify her inner circle friends, and focus on putting more effort into those, rather than exhausting herself keeping up with the likes of me! (Unless I make the top 5! Lol) The point being for her to identify her number, then assess if she is putting effort into the right people. The last question she asked perturbed me the most. If I am only capable of 5, what happens when I am at capacity and I meet someone new I want to add in? I could feel her eyes boring into my soul as the ugly truth revealed itself. I met her gaze, gave her a wicked grin and said matter of factly. “Yes. Someone will hit the chopping block!” How awful! I know! Let me explain!! …. That’s not to say that any of my friendships failed because someone better came along! They didn't! If only it were that simple! However it stands to reason that in order to give that friendship the oxygen it needs to burn, the intensity of some of my other friendships is going to reduce. It is not a calculated decision where I make a list and cross someone off! I do try and maintain more than 5 if I am lucky enough to meet worthy people! (Worthy. Got tickets on myself much?! I’m only digging a deeper hole for myself here aren’t I?!) The thing is, some friendships require more oxygen to survive than others. When I reduce that oxygen, some of them just fizzle out. They needed that intensity to keep burning. While at the start of a new friendship, there often is that rush and that excited intensity, if it continues to need that same level to burn, it has probably become unhealthy. Very few friendships in this category have learned, on either side, to handle the reduced flow! Jealousies and insecurities creep in and cracks start to form at the foundation. A little bit of space becomes a whole lot of drama or distance, usually both! Of course, sometimes it boils down to “You seem to like friend 6 more than you like me?” There is no easy or nice way to say this, but often, that is the cold hard truth. You can’t always explain the chemistry you feel with someone, even in friendship, and nor should you have to. After all, one of the best things about friendships are the non-monogamous, voluntary, open nature of them. If I choose to emotionally move away from one in favour of the other, that is ok. Even if I have known one longer than the other. If that turns out to be a mistake on my part, and I have been burned by this before, then that is my cross to bare! I have been on the brutal receiving end of this emotional shift myself, so I do understand how confusing and hurtful it can be when a close friend suddenly pulls away somewhat in favour of somebody else. Experience has taught me to tolerate the shift and wait back in the outer circle for another opening, IF the friendship means enough to me that is. Let the new friend have the oxygen that is needed to grow a new inner circle companion, then there will be plenty to go around in time. One hand feeds the other. I can’t help this. 5 is my natural instinctual number. None of us have unlimited energy to give to friendships, nor unlimited oxygen to keep them burning on high heat. If a friendship can't simmer, I guess it will burn out... or you will, trying to maintain too many friendships and finding none of them are that close or maybe even reciprocal as a result. This is true regardless of your number. This is what it is all about. Increasing the value regardless of the size. Newer PostIs Loneliness your friend? Older PostIs a sense of detachment a good thing or a bad thing in Friendships?